The inaugural Open House Bendigo Weekend 2018 Program was launched this morning at the striking Bendigo TAFE Octagonal Reading Room – a participant in this year’s regional program. The launch delved into the diverse program taking place on the 27 + 28 October, boasting 23 buildings including outstanding private homes by e+ architecture, significant heritage redevelopments including architecture tours by Y2 Architects of Ulumbarra Theatre, Bates Smart-led tours of the major Bendigo Hospital development, and a special preview of the Soldiers Memorial Institute extension by Lovell Chen. Open House Bendigo is presented by the City of Greater Bendigo and Open House Melbourne. A number of special events include a panel about good design & heritage, free screenings of interviews with some of the country’s most significant architects and designers, a slide night with The Gents about Signs of Australia and a talk with RACV about small and smart living in the city to accompany the RACV Tiny Home outing in Bendigo. The Weekend provides a public platform for celebrating a dialogue about design in Bendigo, shining a light on significant heritage sites and spaces of architectural excellence and contemporary design. The program aims to create a sense of civic pride in the changing urban environment of Greater Bendigo. The full program is now online and the printed Open House Bendigo program will be available as a lift-out in the Bendigo Advertiser on Saturday 13 October. Originally designed by Architect George Dawson Garvin, the Soldiers Memorial Institute is a heritage- listed cultural site that was officially opened by the Governor of Victoria in 1921. The recent addition of the gallery connected to the Institute requires museum-quality environmental control standards at all times, an initiative pioneered by Lovell Chen. In addition to the main building, the extension will also be open to the public, showcasing an energy recovery ventilation system and the use of minimal structural steel to eliminate thermal bridging. Widely recognised as one of Australia’s most innovative and popular regional galleries is the Bendigo Art Gallery, restored by Fender Katsalidis Architects in 1997, and again expanded in 2014. Self-guided tours over the Weekend will afford an intimate view of the gallery’s signature post-modern red brick and extensive glazing across the new north- facing façade, as well as the sculptural elements of the building itself. Another program highlight is the Bendigo Tech School which was designed by Vincent Chrisp Architects, in collaboration with La Trobe University and other industry partners. Pre-booked activities include a hard-hat tour of the Level 2 construction underway on Saturday 27 October. 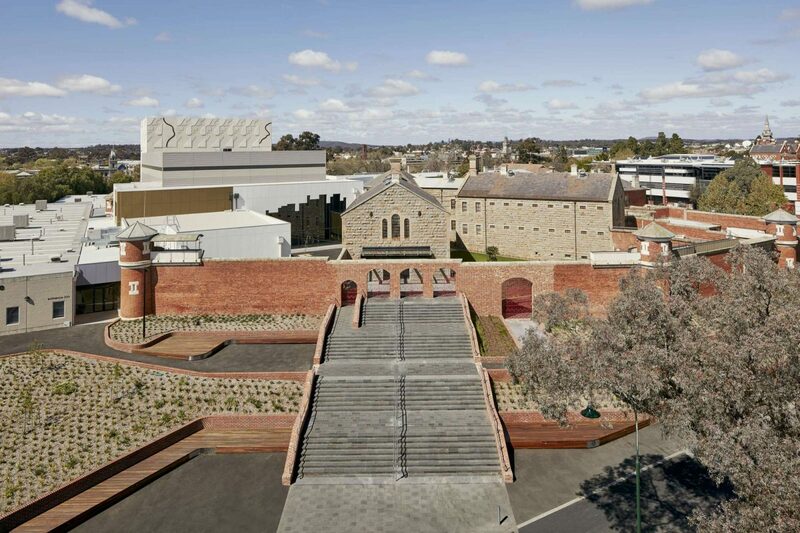 Renovated in 2015 by Y2 Architecture and international theatre design specialists Schuler Shook, the Ulumbarra Theatre merges contemporary design with distinguished heritage elements of The Sandhurst Gaol which the modern performance space was formerly known as. The former prison was also the scene of Victoria’s longest prison siege, with former inmates including Ronald Ryan and Chopper Reid. There will be architect-led tours over the Weekend, allowing visitors the chance to see how elements of the gaol structure have been retained as a design feature of the theatre. A residential highlight is the re-developed Miners Cottage by e+ architecture. With a heritage overlay to the property, the cottage has been transformed from a derelict home to one that embodies a process of considered design and planning, taking a long- term view in approaches to housing. Another residential highlight is Short Street by e+ architecture, which boasts a contemporary approach to design achieved using traditional materials as a nod to its heritage overlay. The residence was renovated in a bid to increase the living areas of the existing house, using traditional materials such as zinc and hardwoods featured in past era housing. Tours will allow visitors to experience the simple yet long-lasting materials that have been used throughout the home which bridges design features of the past into a modern setting. All residential homes are pre-booked, with first release opening Monday 8 October at 8.30am, and a second (and final) release a week later on Monday 15 October. The Open House model, first started in London 25 years ago, facilitates opportunities for a city’s inhabitants to directly experience how well-designed cities can improve their lives, by opening examples of architectural excellence to the public. These experiences stimulate dialogue about architecture and learning, which empowers people to advocate for a well-designed built environment.